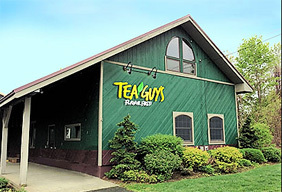 Tea Guys is a full wholesale tea solution provider offering both hot and iced tea bags, matcha powder, bulk tea, tea concentrates, and an extremely exciting, first-of-its-kind, sparkling tea. It all begins with our hand-blended tea recipes. The flavor we pack into each tea bag, each sip of sparkling tea, or our own micronized tea powder is vibrant and unique. We make every batch by hand in small lots – not because it’s easier – but because it’s the right way to create the product we want. Our blending facility and store are located in Whately, MA – a small New England farming community. “I have been trying to replace my morning coffee with the healthier option of tea and just could not find a replacement. Spent much $$$ at Teavana and could not find anything that would satisfy until I found Teaguys.